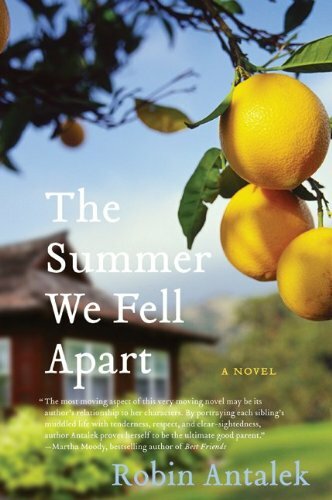 Like the last novel I reviewed, A Soft Place to Land, Robin Antalek’s The Summer We Fell Apart is a novel about siblings in crisis, spanning the years from adolescence to adulthood as the characters come to terms with the traumas of their past. Amy, George, Kate and Finn are children of a theatre couple who are far more absorbed in themselves and their struggling careers than in the four children they have produced. Their father experienced some success as a playwright early in his career and spends the rest of his life alternately mourning the loss of that success and trying to recapture it. Their mother Marilyn constantly reinvents herself as an actress but achieves cult-status fame only accidentally, later in life, with roles in a series of slasher horror flicks and their associated video-game spinoffs. During the years their four children are growing up, the Haas parents are far more interested in their own problems and their disintegrating marriage than in parenting, so Amy, George, Finn and Kate are more or less left to raise themselves – with varying degrees of success. Each of the four siblings takes a turn narrating the story, so that the result is four mini-novellas, each shedding light on a character and situation we’ve previously seen only through others’ eyes. Earlier this year I read another novel about three siblings told from each point of view in turn and felt I’d been cheated out of the full story in each case (that was Wayson Choy’s The Jade Peony), but in this case the four stories weave together beautifully, each picking up where the previous one leaves off, creating a whole. The four siblings each have their own way of reacting to their dysfuncational family life. Kate becomes a super-powered, super-successful lawyer, while Finn becomes a hopeless alcoholic drifter. In between these two extremes the younger two children, Amy and George, are the only two who remain close to each other. They mange to cobble together relatively happy, or at least functional, lives for themselves, though each is a little handicapped in the areas of love, trust and intimacy. Though Amy and George are the most likable and warm of the four sibling narrators, the most poignant part of the story, for me, is when Kate makes a doomed effort to reach out to Finn, taking him into her home and trusting him with the job of renovating her new house, hoping, perhaps, to save both herself and Finn. I can find things to quibble about with this novel – there were times I felt there was far too much telling and not enough showing, and palaces where the writing style just didn’t click for me. But these were minor problems in a novel that was, overall, well-crafted and enjoyable. I found it interesting that after allowing each of the four siblings a turn at telling the story, Antalek gave the epilogue to their mother, Marilyn, a character who has been largely vilified in her children’s versions of their life stories. Marilyn’s epilogue emphasizes that there really are many sides to every story, and leaves the reader with not four but five memorable characters – characters that lingered in my memory long after I finished the book.